Daubeny, Hugh A.. "Cultivated Berries". The Canadian Encyclopedia, 04 March 2015, Historica Canada. 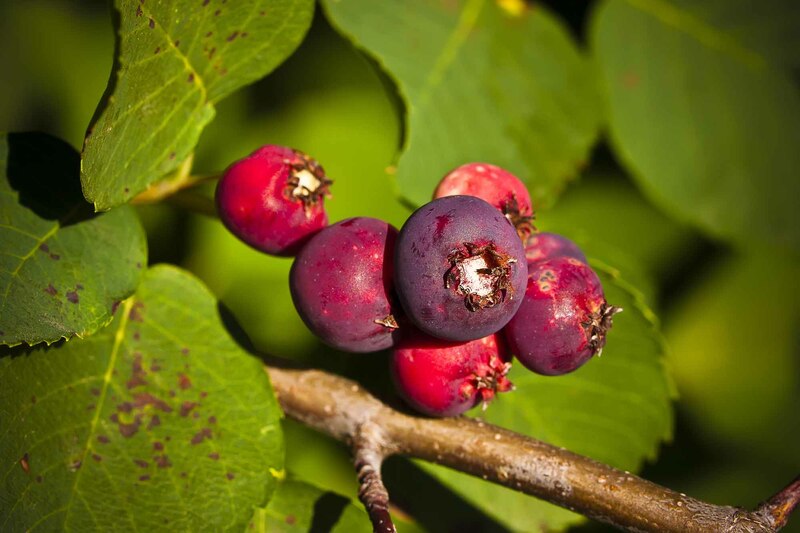 https://www.thecanadianencyclopedia.ca/en/article/cultivated-berries. Accessed 25 April 2019. The most important berry fruits produced in Canada are strawberries, red raspberries, blueberries and cranberries. Blackberries, black- and redcurrants and gooseberries are of less importance but are increasing in popularity. Strawberries are among the most important berries cultivated in Canada (courtesy Isis Gagnon-Grenier). At Delta, BC (Corel Professional Photos). Raspberries are one of the many species grown as food on Canadian farms. Genetic diversity helps enhance productivity, colour, disease resistance and flavor (photo by Don E. McAllister). The most important berry fruits produced in Canada are strawberries (Fragaria x ananassa), red raspberries (Rubus idaeus), highbush and lowbush blueberries (Vaccinium corymbosum and V. angustifolium, respectively) and cranberries (V. macrocarpon). Blackberries (various Rubus species), black- and redcurrants (Ribes nigrum and R. rubrum, respectively) and gooseberries (Ribes grossulariia = R. uva-crispa) are of less importance but are increasing in popularity. Within Canada, southwestern British Columbia remains the most important production region for all berry crops except lowbush blueberries, which are produced almost exclusively in the Maritimes. Strawberries are also important in southern regions of Ontario and Québec and in the Maritimes. They are also produced in localized areas outside urban centres in the Prairie provinces. BC, along with Washington and Oregon, comprises one of the world's premier production regions for red raspberries. In recent years, production of blueberries and cranberries has increased significantly in BC and in parts of eastern Canada. The other berry crops are grown mostly in BC and to a lesser extent in Ontario and Québec. Raspberries and strawberries perform best on fertile, well-drained soils. On heavier soils, growth of both crops can be seriously impaired by root rots. Highbush blueberries flourish on acid soils, high in organic matter. Lowbush blueberries do best on acid soils, usually of moderate to low fertility. Cranberries thrive on acid soils under bog conditions. The other fruit crops have similar soil requirements to those of raspberries and strawberries, though blackberries often can be grown on heavier soils than those suited to raspberry. All the small fruit crops are considered to be perennial though strawberries, which are herbaceous, are sometimes replaced every other year due to decline in vigour and productivity. 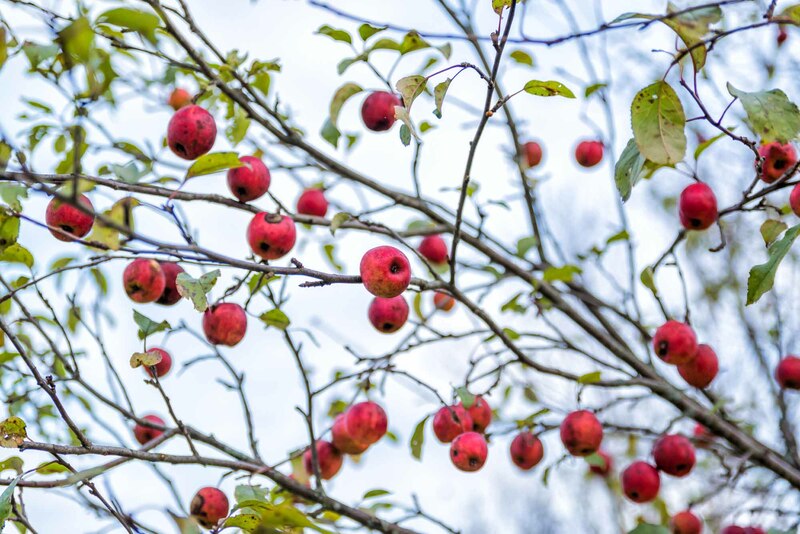 Plantings of the other berry crops can last for many years provided they are not decimated by disease-causing organisms or by insect pests, or irretrievably damaged by extreme environmental conditions, such as drought or unusually low winter temperatures. All of the cultivars of each of the berry crops are self-fertile, though for both Vaccinium and Ribes, it is recommended that two cultivars be put at any one site to obtain maximum fruit set. Bees are important for pollen movement in all the crops. 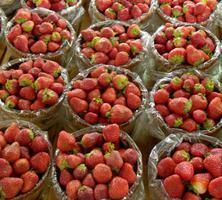 All strawberries and fruit of the other crops destined for fresh market use are harvested by hand. Machine harvesting by various types of shaking mechanisms is common in red raspberries and highbush blueberries destined for processing uses. 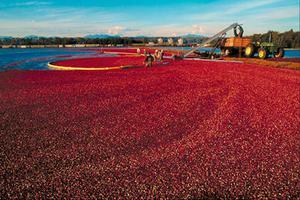 Cranberries are usually harvested by machines that rake or beat the berries from the vines. Lowbush blueberries are harvested by hand-operated rakes. Strawberries are grown under one of two cultural systems. In the hill-row system, all runner plants are removed and fruit production is entirely from the original mother plants, which are spaced 30-35 cm apart in rows 2.7-3 m apart. For the fresh market, plants are sometimes grown on raised beds covered with plastic so that fruits are clean and less prone to rot. Raised beds also help to reduce the incidences of root rots. In the matted-row system, predetermined numbers of runner plants are allowed to root; thus, both the original and the runner plants are allowed to produce fruits. The original plants are spaced 50-75 cm apart in rows 2-3 m apart. Fruits from hill rows are usually larger and go to fresh market outlets; the smaller fruits from matted rows are often processed. Raspberry plants, which are usually planted in early spring as one-year-old dormant canes, are spaced in rows 2.5-3 m apart. In established plantings as many as 12 canes are left per plant or stool. The spent fruiting canes are removed in winter. In early spring, the current year's fruiting canes are pruned to 1.5-2 m.
Highbush blueberries are spaced 1.5-1.8 m apart in rows 3 m apart. Annual pruning, which removes the older wood and weaker canes, is done in winter. Since most lowbush blueberry plantations are developed from natural stands, there are no spacing recommendations. Pruning is done in late fall or early spring by burning with oil-, propane- or straw-fuelled fires. Cranberry bogs are established from 7-10 cm long vines taken from established plantings. They are planted at a rate of 1700-2200 kg/ha. Berry crops are all vegetatively propagated and are prone to attack by insects and various disease-causing organisms. Virus diseases are particularly difficult to control. Raspberries are affected by the mosaic virus complex, which can have devastating effects on plant vigour and fruiting; it has been effectively controlled by use of genetic resistance to the aphid Amphorophora agathonica. Not as easy to manipulate by genetic means is another virus, raspberry bushy dwarf, which is pollen-transmitted. Resistance is mostly determined by escape from the virus under field conditions. Some cultivars become infected at a much faster rate than others do, and it is recommended that virus-free planting stock be used and planted in isolation from possible sources of infection. Strawberries are also affected by aphid-borne viruses and the best control is obtained by a combination of aphid control and virus tolerance. 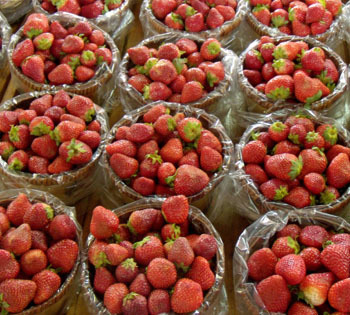 Both crops can also be seriously affected by root rots caused by Phytophthora fragariae var fragarae and Phytophthora fragariae var rubi, in strawberries and raspberries, respectively. Incidences of root rot can be reduced by planting on well-drained sites and by using elevated or raised beds. Blackberries and the Vaccinium and Ribes crops are not as susceptible to root rots as raspberries and strawberries. All the crops are susceptible to various organisms, mostly fungi, that cause fruit rot or fruit rot-like diseases. Botrytis cinerea is the main fungus causing rots in strawberries, raspberries and blackberries. Reduced incidences of rot are usually obtained by good cultural practices, such as reductions in plant densities, sanitation practices (such as removal of plant debris) and the use of cultivars with lower levels of susceptibility. Mummy berry, caused by the fungus Monilinia vaccinii-corymbosi, is a serious disease of blueberries, as is cottonball, caused by the related fungus Monilinia oxycocci, to cranberries. 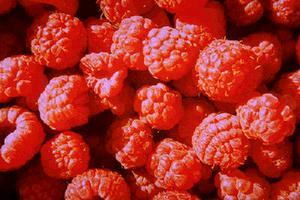 Various cane diseases, most of which are caused by fungi, can be serious in raspberries and blackberries. Control is usually through sanitation, reducing cane numbers and the use of cultivars with some resistance or tolerance. Insects and mites can cause significant damage to all the berry crops. Again, control is best implemented by cultural methods including sanitation, reduced plant densities, crop rotation and also by biological methods using predators. Judicious use of recommended chemicals may aid in the control of both insects and some of the disease-causing organisms. Also, avoidance of monoculture and the practice of crop rotation often help. All new planting of each of the berry crops should be done from plants free - as far as can be determined - of disease and other pests. The future of berry production in Canada seems to be assured despite the competition of imports from southern climes. The quintessential quality and flavour of locally produced fruit is recognized as unique. The continued introduction and acceptance of well-adapted superior cultivars, such as the "Tulameen" raspberry and the Cavendish strawberry, are necessary for the expansion of local production and greater self-sufficiency. New cultivars must have resistance to insect and disease-causing organisms. Resistance is of immeasurable benefit to the environment, the producer and, ultimately, the consumer. The importance of berries as sources of phytochemicals, including antioxidants, that help combat the effects of degenerative diseases associated with aging is a major factor in the future expansion of berry crop production in Canada. Some other factors necessary for expansion include the use of more efficient production practices (mechanized harvest aids, use of soilless growing media, innovative training systems, etc), growing in protected structures (greenhouses, plastic tunnels, etc) and the use of alternative marking systems ("U-pick," farmers' markets, etc). Berry production will continue to benefit from the use of biological control agents for suppressing insects and disease-causing organisms. Impediments to the expansion of berry production in Canada include competition from imports, the loss of suitable environments for growing the crops, and lack of innovative research in all aspects of production. Both the public and private sectors must be aware of the impediments and cooperate to overcome them.